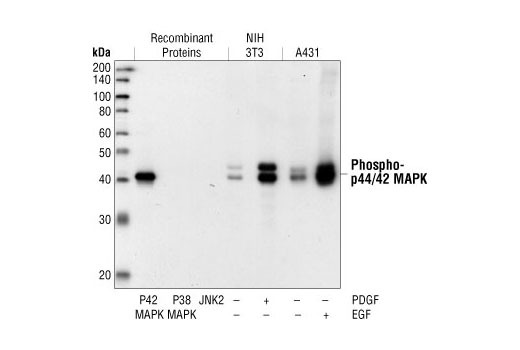 Western blot analysis of active p42 MAP Kinase, active p38 MAPK and active JNK2 proteins, as well as extracts from PDGF-treated NIH/3T3 cells and EGF-treated A431 cells, using Phospho-p44/42 MAPK (Erk1/2) (Thr202/Tyr204) (20G11) Rabbit mAb. 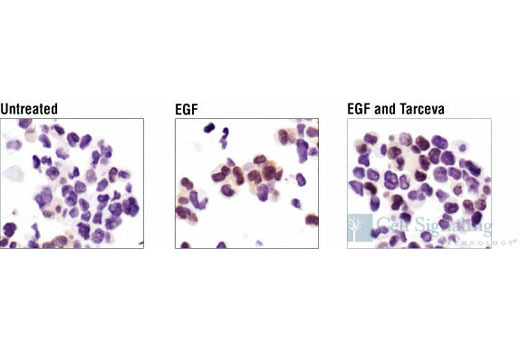 Immunohistochemical analysis of MDA-MB-453 cells, untreated, EGF-treated or EGF/Erlotinib-treated, using Phospho-p44/42 MAPK (Erk1/2) (Thr202/Tyr204) (20G11) Rabbit mAb. 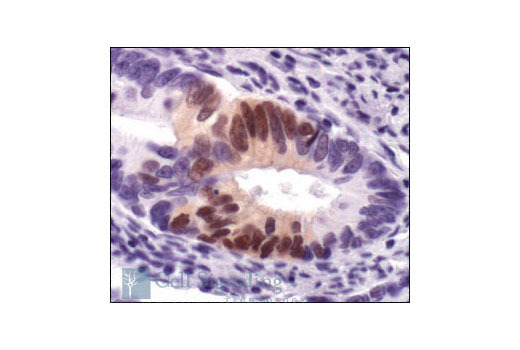 Immunohistochemical analysis of paraffin-embedded human colon carcinoma, using Phospho-p44/42 MAPK (Erk1/2) (Thr202/Tyr204) (20G11) Rabbit mAb. 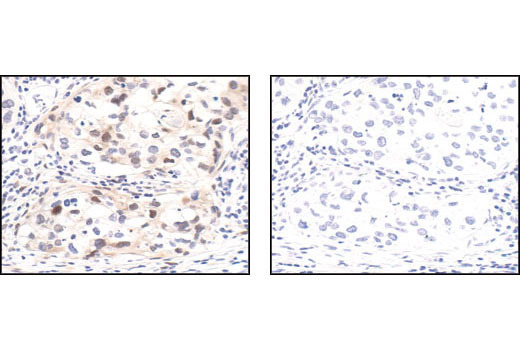 Immunohistochemical analysis of paraffin-embedded human prostate tumor, using Phospho-p44/42 MAPK (Erk1/2) (Thr202/Tyr204) (20G11) Rabbit mAb (left) or the same antibody pre-incubated with Phospho-p44/42 MAPK (Erk1/2) (Thr202/Tyr204) Blocking Peptide #1150 (right). 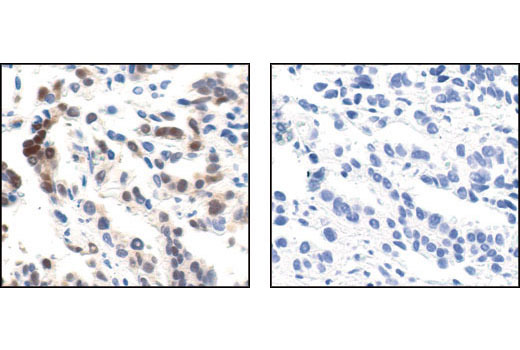 Immunohistochemical analysis of paraffin-embedded human lung carcinoma, untreated or λ phosphatase-treated (right), using Phospho-p44/42 MAPK (Erk1/2) (Thr202/Tyr204) (20G11) Rabbit mAb. Phospho-p44/42 MAPK (Erk1/2) (Thr202/Tyr204) (20G11) Rabbit mAb detects endogenous levels of p44 and p42 MAP Kinase (Erk1 and Erk2) when dually phosphorylated at Thr202 and Tyr204 of Erk1 (Thr185 and Tyr187 of Erk2), and singly phosphorylated at Thr202. The antibody does not cross-react with the corresponding phosphorylated residues of either JNK/SAPK or p38 MAP kinase.